"The forest. Strange. Eerie. Mysterious. A place of magic and surprise"
So begins the Orchestra version of Roald Dahl's Little Red Riding Hood, with a delightful full-orchestra score by Paul Patterson. Rest assured, the familiar cast of characters are here: there’s a wolf, a grandma and a little girl in a red cape. But Dahl, author of such children’s classics as Charlie and the Chocolate Factory and James and the Giant Peach, has twisted things around and spiced things up. 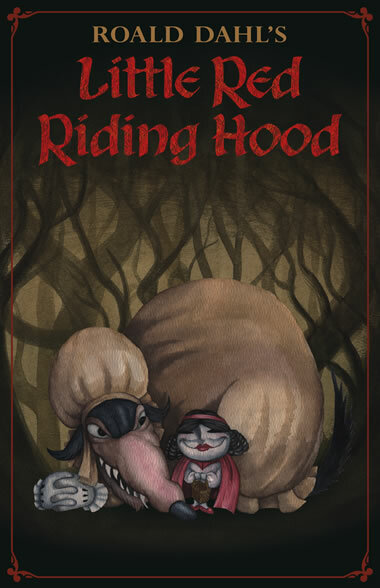 Dahl's feisty Little Red can certainly take care of a dim-witted wolf by herself! 3 performers bring Roald Dahl's bizarre imagination to life in Dandi Productions’ sparkling presentation with skilful lighting, bold costuming, incredible puppets and clear, broad acting. To turn her into red ice-cream!" Remember, this is the work of Britain's Roald Dahl, and the British have a centuries-old tradition of pantomime and broad comedy... all lovingly interpreted by the members of the Dandi troupe - who bound on stage in their highly-recognizable red long-underwear. Take a symphonic walk through Roald Dahl's magical, terrifying, hilarious forest. 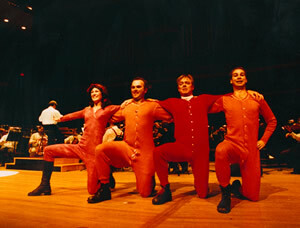 N.B: To make the program a little longer, and to prepare the audience for Mr. Dahl's rather twisted take on this time-honoured tale, we created a "Prologue", which we perform while the orchestra plays "Entry of the Gladiators", (or some other appropriate selection) and about six or seven minutes beyond. The Prologue introduces the young audience to elements of pantomime, slapstick and the other broad acting styles employed in the telling of the tale. This brings the total progam length to about 46 - 50 minutes. It is up to each orchestra whether they would like to include a piece before the Prologue, but we recommend it be kept short! Dandi’s version of Roald Dahl's Little Red Riding Hood incorporates broad acting, choreography and much interaction with the audience. NOTE: The orchestra or venue must provide a functional Rocking Chair, able to support the seated weight of a 170-lb actor. 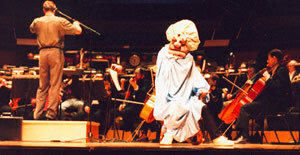 The actors will travel behind the orchestra, onstage, so space should be made available. 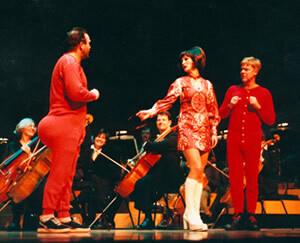 They may also travel backstage around the orchestra. In the Stage Left Wings, a quick change area is necessary. A small table and chair are required, and a mirror. NOTE: The actors' voices will be amplified, so 3 wireless body mics (Lavs) must be provided by the orchestra or venue, along with a sound operator. They should be of the clip-on variety, NOT Madonna-style. Dandi will provide mic belts. Two lockable dressing rooms, with easy access to a washroom. A stage manager is required, to call the lighting cues. To book Little Red Riding Hood and to inquire about the music rental - please contact Dandi Productions Artistic Director Doug McKeag.